Digital drawing of campus architecture, Hamilton (Ont). My focus for the past week has been a proposal for a commission job. I can’t really go into details but if successful would be a really positive development. The proposal pushed me to get my CV updated. I also created a dedicated artist’s website. The site is a WordPress product and I used a free theme to get things started. In the past few months, I have been looking at different artist’s sites for inspiration. I would like something more polish up and running before I start showing at group shows. Otherwise, I am continuing to work on my campus building iPad Pro project. 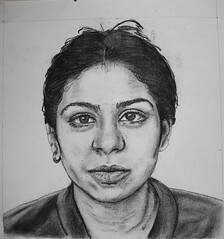 This project is meant to work out the bugs of using digital created images oppose to more traditional drawing on paper. Related to the working in digital, I am considering creating a work for submission for a digital competition for floral images. This contest would allow me to judge my efforts against others with more experience with floral painting. All this digital painting stuff is related to my discovery of David Hockney efforts with digital tools and the creation of digital paintings worthy of being show in galleries. I will keep you posted on how things work out. Thanks for dropping by. Why – Urban buildings and Landscapes? Buildings and the land that surrounds them reflects our collective values and priorities. When I first started painting, I was very focused on portraits and figures, trying to capture the essences of the subject. I found it amazing that 500 years later, you could gaze into someone’s eyes and get a sense of their personality and character. However, portraiture is conflicted by biases and deceptions created by the sitter, the artist, and the audience. Each player trying to control the message that the portrait is trying to convey. There is also the additional challenge of why would collector want to hang some stranger on their wall. Unable to resolve these problems of the individual, I shifted my focus to tree portraits. Viewing trees as a sort of collective representative of the community that surrounds them. In urban settings, the placement and continued survival of trees is not accidental. There is too much competition over land use to let this happen. Winston Churchill Park, Hamilton (Ont). The presence a tree or a group of trees is a visual statement by the community. 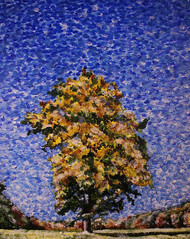 In effect, tree portraits became a proxy for a human portrait. It is hard to hide your values behind a huge tree living in a middle of a park such as the large tree that used to grow in the middle of Churchill Park in the west end of Hamilton, Ontario. 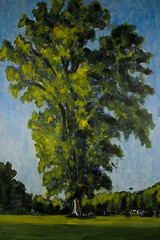 For nearly two years, this large and imposing tree became the focus of my artistic, from life, efforts. In the 1920s, the land was set aside for further development of residential homes. However, the Great Depression brought these plans to a halt. Over time, the land came into control of the city and was made into an urban park. The name of the park reflected the post-war character of the surrounding neighborhood, British and fading colonial empire might. Within the last 10 years, the great tree was lost to a winter snow. The lawn bowling club that used to be busy with bowlers dressed in summer whites is now closed. Churchill Park, same view (2016). The community is now much more diverse and the edge of the forest that surrounds one side of the park is now protected by a wild grass transition zone. From managed stateliness to managed wildness. Trees introduced me to the concept that to understand people, it is sometimes better to look at their handiwork rather than their faces. Now, I have shifted my focus to buildings and the lands that surround these structures for clues about what we really value in life. Fat Cats and Starving Dogs is a personal website; the goal is not to sell art but to explain what it takes to make art. However, I now need an artist’s website. For the past year and a half, I have been struggling to master oil painting techniques and to find a voice in the field of contemporary urban landscape painting. Furthermore, I have also been struggling to find time to create a consistent body of work that I can present to galleries and collectors. While these efforts continue to challenge me, I now need an artist’s website that can place my new creations within a larger context of art-making. So, as I create my individual works, I need a place where galleries and collector can visit and understand what I have to offer them. As I have mentioned before, I originally started off as a portrait and figure painter. However, the challenges of post-modern identity and perspective caused me to shift focus to tree portraitures. It was my way of examining people’s character and personality via the landscapes they create for themselves. Today, my focus is on architecture and urban landscapes. In a way, I am still continuing the themes of my earlier efforts. By creating a portfolio that highlights my tree portraits, maybe I can bridge this pre-2006 period with what I am creating today. Using technology to help create and shape your paintings always seemed as a bit of cheating. Even the Use of reference photos seemed a bit iffy. However, I came of age when this technology was just entering the painting world. Today, young artists take technology as a given and seem to use it freely if they believe it advances their art. I say all this because of my recent re-connection with David Hockney. Hockney is one of my artistic hero’s for his use of: realism, colour, and perspective. To have the career that he has had and still be relevant is amazing. The Pace gallery just had a show (Apr 29 to Jun 18) featuring David Hockney’s iPad drawings of the Yosemite Park in California. These iPad creations are just amazing, given my recent purchase of an iPad Pro, I was curious on how Hockney was incorporating this technology into his art-making process. The Pace Gallery show then lead me to the artist personal website and his videos of his large scale painting made from life. 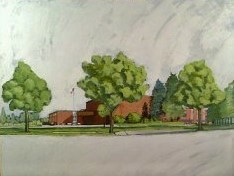 What I really from interesting was his use of Photoshop to mock-up his large scale painting that were executed on site. In his art-making, Hockney seemed to bounce back and forth, between on location to re-working the composition in Photoshop back in the studio. This got me thinking about re-working one of my old, unfinished, “from life” paintings. 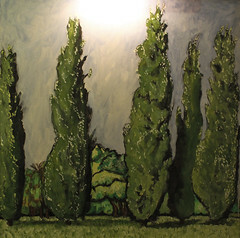 The Ghost Tree is a 2006 painting that marked of my tree series. 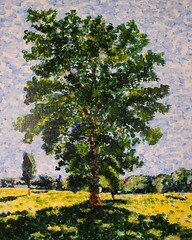 Ghost Tree Painting (from life – May-June 2006), Churchill Park, Hamilton (Ont). 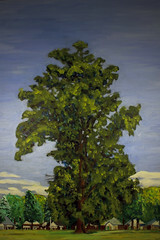 In the 10 years since this painting was first started, the grand old tree was lost to a winter storm. So, with David Hockney as an example, I wondered if I could incorporate, from life sketching, Photoshop compositing, and re-working in oils of the old painting. So, this past week, I took a bunch of reference photos of the site and then started a sketch of the current trees and landscape to deepen my knowledge and awareness of the landscape. Ghost Tree Landscape, Churchill Park, Hamilton (Ont). Photo taken on June 17th, 2016. Over the next few weeks, I will experiment with this new art-making process to see how much value I can gain from the experience. One of my major activities is exploring the city for reference material for future compositions. On these visits, I try and frame shots to see if something might click. For example, visiting the former remains of the 1912 Westinghouse foundry on Longwood, I am was curious about the potential for urban decay industrial landscapes. The abandon buildings have provided countless images for landscape photographers over the past twenty years. 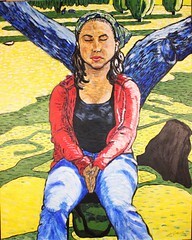 I am also interested in finding subject matter for compositions that might be submitted to the MIP art shows. If I can find an appropriate urban theme derived from the site, I may submit that composition for the fall show. Last week, I made a second visit to the Suzy Lake Show at the campus art gallery. Landscapes are not neutral places. Why do we care about one place and not another? Often our connection is rooted in personal experience and memory of particular place. Sometimes is even more remote, with our views of landscapes shaped by family stories and legends of relatives long gone. This is the ground that Suzy Lake performance art covers. I have tried several times to explore this area of landscape and memory, but have been unable to make it work. Reviewing the show for a second time, I find it interesting how she incorporates herself into the photos. Suzy Lake’s solo show is on until August 20th, 2016 at the McMaster Museum of Art. May 5th, 2016 – The campus art gallery held an artist’s talk with Joseph Hartman. Hartman is a Hamilton-based artist who uses photography to explore various themes; mostly urban landscapes. I find that most interesting contemporary urban landscapes are being done in photography, and not painting. At the moment, painting seems fixated on rural or urban-nature themes. It was Joseph’s urban settings that attracted me to this event. The crowd of 30 plus people was quite impressive, particularly given the nice spring weather and the fact that exams have finished. 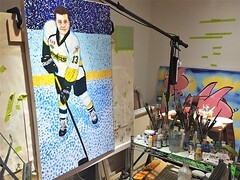 Hartman has several claims to fame: he is a campus grad, his father is the famous painter, John Hartman; and he studied under Edward Burtynsky, who now has an international following in landscape photography. John Hartman is one of my favorite Canadian landscape painters. I fell in love with his work in the early 1990s with an amazing large scale canvas that the campus gallery owns. Edward Burtynsky we discovered back in 2005, just after his big New York City show. We wanted to buy one of his Italian quarry photos, but $5,000 price was just beyond our comfort level. We always regretted our hesitation because these works quickly sold out and the price of his newer works are now in the $15,000 to $20,000 range. The best thing I can say about Joseph’s work is it very independent from the influences of his father or Burtynsky. 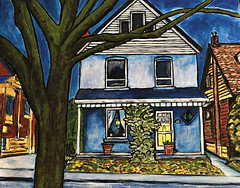 I felt a strong connection to several of his works, particularly the mountain views of the city with their use of colour and streets to organize the mass of the details. I believe Charles Meanwell was in the audience, but after the talk he disappeared into the crowd. I am a big fan of his work. I didn’t hang around for the reception, these things always make me uncomfortable. I highly recommend seeing Joseph Hartman’s work either at the campus art gallery or the upcoming Carnagie Gallery show in June.